If you feel like you’re always hearing about your friends or family members trying to lose weight, the reason might be because about half of American adults are trying to lose weight, according to a study. After writing about the boiled egg diet, I tried it myself and lost 7 pounds in 7 days—which may not sound like a lot, but I was satisfied with the results as I reached my goal. However, for many people weight loss can be difficult, and some people would rather resort to surgical fat removal than starting diets and regular workouts. This explains why two out of five people quit a diet after the first seven days, and only 20% last longer than three months, according to a survey published on Health.com. A common mistake people make when trying to lose weight is making drastic changes all at once and wanting to see results after one or two days. After losing sight of the bigger picture, they fail to focus on the end goal and give up the diet plan prematurely. A better approach is by going one step at a time. One successful dieter is Keely Dellit, an Australian mom of three. Her small-step approach to a healthy lifestyle helped her reach her goals and shed an amazing 125 pounds over a period of 14 months. She didn’t have any surgery, she simply made one tiny change per week—which let her ease into a healthy lifestyle. Most importantly, she was patient and focused. In an interview with Women’s Health, she said her turning point happened the day she got home from the hospital after having her third child. At the time, she weighted 278 pounds, her highest weight ever. She wanted to make a change, not just because of the number, but because she felt unhealthy and exhausted. Also she wanted to get healthy for her three kids. Keely wanted desperately to change, but she knew that she had to find the easiest way to lose the weight, since she didn’t have the time to commit to a brand new lifestyle. So she made small changes on a weekly basis. She did not cut out fast food and treats she loved at first. She simply chose smaller portions, for example small fries over medium size. Then gradually, she made healthier substitutions, such as grilled chicken instead of fried. She then swapped soda with juice and later changed that to sparkling water. She started cooking brown rice instead of white, replaced dairy with plant-based milks and ate at home instead of ordering takeout. 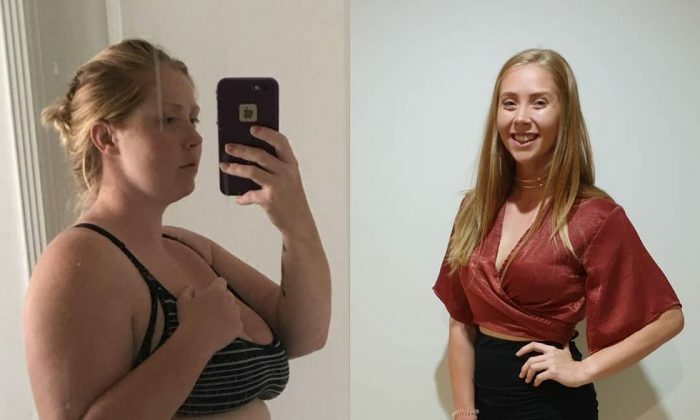 Keely explained that she didn’t find weight loss too difficult, because she made small changes gradually, and these gradual change allowed her to slowly transform into a healthier lifestyle. Keely’s diet is healthy, nutritious, and low in carbs and calories. She also made sure to drink a lot of water, about one gallon every day. Keely didn’t just transform her eating habits, she also took up a workout regimen. At the beginning she didn’t have a real workout plan, just walking around the park with her children or following workout routines on YouTube at home. But as she got stronger and more confident, she decided to step up her workouts and join a bootcamp class. She loved the classes so much that she eventually became a certified personal trainer. After fourteen months of persistence and focus, Keely had lost an impressive 125 pounds from her peak of 278 pounds. She admitted that it was not easy at times, but she knew how badly she needed to change and get healthy. On her Instagram account, she posted, “Never let a stumble in the road be the end of the journey.” Her perseverance has paid off, and she now feels a lot fitter, healthier, and happier. 6 Signs of Food Addiction to Watch out For—Do You Crave Food Even When Full?